Know that sharp ache you get after an intense workout that is usually in your neck, shoulders, or upper back? It can be difficult just to move your shoulders without feeling pain, let alone continue with your workout. Even worse, this pain can linger on for weeks, or even months. Trigger points in a constant state of contraction have excess metabolic waste and oxygen use because blood flow to this area stops—this sends pain signals to the brain. Because your brain wants to stop the pain, it commands the muscle to rest, which leads to under-usage of the muscle. This is what makes the muscle shorten and tighten up. If you are developing muscle knots frequently from lifting weights in your shoulders, neck, or upper, or middle back, the likely cause is a postural issue. For example, if you have rounded shoulders from sitting in a office, your back muscles are already overstretched because your shoulders are rounded forwards. When you complete some pull-ups, or rows, your muscle will be stretched even further when lowering the weight, then will forcibly contract when lifting the weight. This over-stretching combined with intense contractions can overstimulate your muscles causing those nasty muscle knots to form. How Can I Treat Muscle Knots? 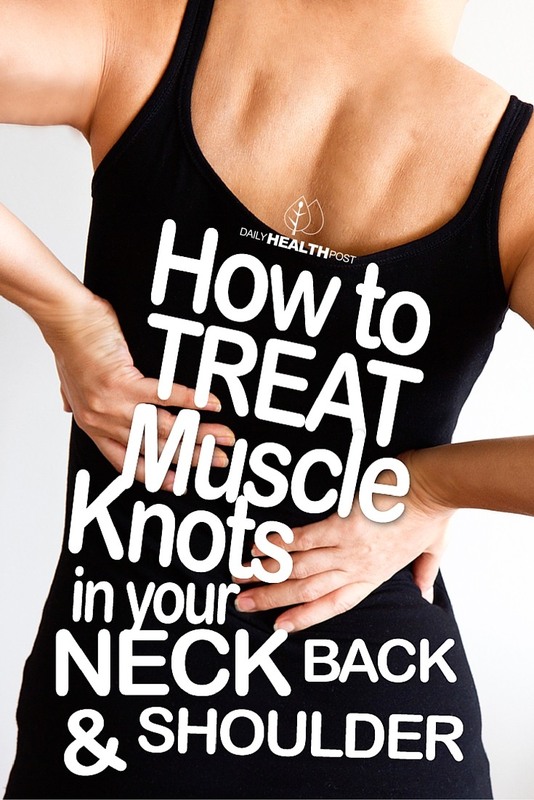 If you do have a painful knot, you’ll be glad to know that you can treat it yourself. While using a massage ball is ideal, you can also use a tennis ball, or a lacrosse ball. To treat the muscle knot, simply roll the massage ball pressed either to the wall or the floor one side, and your body on the other over your muscle. You can use two tennis balls, or massage balls if you want to go firmer or deeper. The massage ball will conform to the tissue and surrounding area slightly, so it mimics the feel of a therapist’s hands. This helps to truly mobilize the tissue beneath, whereas a tennis ball will often fold in or simply compress and not conform. You can put the ball into a sock, or sleeve so it’s easier to hold onto and you won’t need to chase it down in case it drops. Note that, as mentioned before, it’s possible the pain you feel might not be near its root. You might be looking at a thorough massage of multiple areas before finding the actual knot. In these cases, another tool you might want to consider is the foam roller, which looks like a giant Lincoln Log. Seen people sitting or lying down on one while rolling back and forth in your gym? They’re foam rolling to cause their muscle fibers to loosen up, which allows blood flow to increase back to the area. As a last alternative, you could apply a deep, stroking massage directly to the muscle knot; however, not the usual “I’m going to be pampered” massage, instead, think about what it feels like to stub your toe. But, just like stubbing your toe, when your pain vanishes, you’ll feel tremendous relief. While most people think of massages as something done with the hands, oftentimes, with knots it’s more effective to use tools. Use a massage ball, foam roller, or a deep stroking massage 2-3x a day until the pain subsides and the knot releases, which can take anywhere from a couple days to week depending on the size of the knot and the intensity of the self-massage. This should be able to clear up any muscle knots you may have. However, just because you’ve gotten rid of them doesn’t mean they won’t come back. To avoid muscle knots in the future, it’s best to stay consistent with foam rolling and deep tissue massages, which can work wonders. 1. Travell, J. G., & Simons, D. G. Myofascial Pain and Dysfunction – The Trigger Point Manual. Philadelphia: Lippincott Williams & Wilkins. 1993. 2. Davies, C., Simons, D. G., & Davies, A. The Trigger Point Therapy Workbook: Your Self-Treatment Guide for Pain Relief. Oakland: New Harbinger Publications. 2004.